Home » Blog » News » How Do Hearing Aids Work? For most people living in San Rafael, hearing aids are about as mysterious as Bigfoot, UFOs, and the correct name for that sliver of plastic on the tips of your shoelaces. While we can’t tell you whether aliens or Sasquatch are real, we can let you know that the plastic tip is called an aglet. While we’re at it, we’ll go ahead and demystify hearing aids, too. While there are dozens, if not hundreds, of different hearing aids to choose from, they all work in the same way: by amplifying sounds in order to enable individuals with hearing loss to communicate more effectively. Though sizes, shapes, styles, and colors vary, all hearing aids contain the same basic components – a microphone, amplifier, and speaker. Together, these parts allow you to hear better. The microphone picks up sound waves, analyzing and converting them into digital signals that are sent to the amplifier. Here, the volume on the signals is increased, and they are transmitted to the speaker. The speaker, in turn, directs these signals into the inner ear utilizing a thin wire or tube. Finally, these electrical impulses are sent to the brain, where they are processed into sound that is recognizable. It’s pretty amazing that such a small device can be so sophisticated! All hearing aids require a source of power, which means either a disposable or rechargeable battery, and a compartment in which to house it. Battery life varies depending on the exact type and model of hearing aid; in general, you can expect 5-14 days of use for disposables, and about 24 hours of use between charges for lithium-ion and other rechargeable batteries. 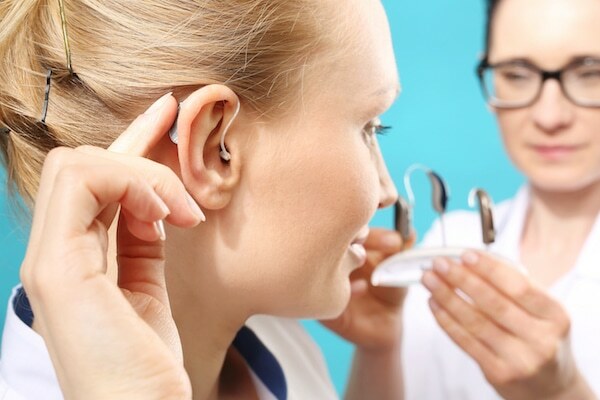 According to your San Rafael audiologist, another essential component of hearing aids is the earmold. Made of plastic or acrylic, the earmold provides an acoustic seal for the sound being transmitted into your ear canal. Earmolds come in a variety of sizes depending on the type of hearing aid. Canal molds are confined to the ear canal only, while full-shell molds fill both the canal and the concha (bowl-shaped portion) of the ear. Half-shell molds are limited to the bottom half of the concha. On/off and volume switches, connective tubing, wax guards, and ear hooks are also found on many hearing aids. Your San Rafael audiologist can help answer any questions you might have about how your hearing aids work.